There is a lot to indicate that the two best teams from the 2013 NFL regular season are facing off in Super Bowl #48. 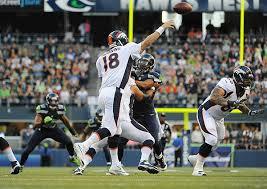 First, the Broncos had the best offense in the league; the Seahawks had the number one ranked defense. The two teams ranked one-two in point differential, and the Broncos had the most wins in the AFC with 13 while the ‘Hawks had the most wins in the NFC, also with 13. Their combined win total of 26 regular victories fell three short of tying the record for most regular season wins by Super Bowl opponents, but those 26 wins are only the 12th time in Super Bowl history that the teams entered the championship game with 26 regular season wins or more. In addition, with both Seattle and Denver winning 13 games, it marked only the eighth time in Super Bowl history that both teams had 13 or more victories. Here’s a look at the Super Bowl matchups with teams that had a combined regular season win total of 26 or more. Of the eight games above where one team had more wins that the other, the team with more victories won the Super Bowl five times and lost three. Note: There were also eight Super Bowls where the teams had a combined total of 25 wins.